Dr AV Prasad has Master’s degree in textile chemistry and a very impressive career. He started his career in the production department in Century Mills. He has been with Clariant and later with Sandoz. He grew from a technical executive to Vice President, Senior Vice President and to the Country Head in textiles. He was the Global Head of new business development handling innovation projects for alliances, joint ventures and collaborations. He has published more than hundred articles and presented more than hundred papers in major seminars. 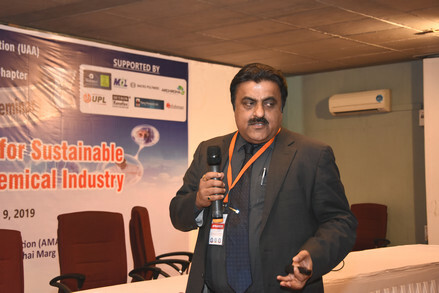 The UDCT Alumni Association (UAA) & the UAA Ahmedabad Chapter organised a 1-day Seminar on “Technology Options for Sustainable Growth of Indian Chemical Industry” on February 9, 2019 to celebrate the completion of 25 years of the UDCT Alumni Association (UAA)- Ahmedabad Chapter. The Silver Jubilee Seminar was held in the HT Parekh Hall of the Ahmedabad Management Association (AMA). Prof. M.M. Sharma, a world-renowned chemical engineering scientist and Former Director of ICT, Mumbai, was the chief guest of the programme. 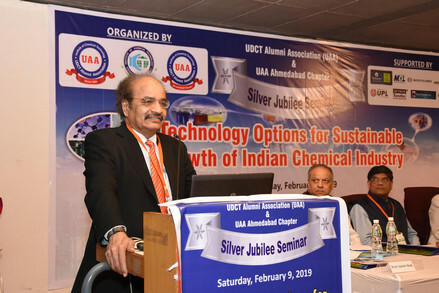 His Keynote Address covered the topic of Innovations in Chemical Industry. 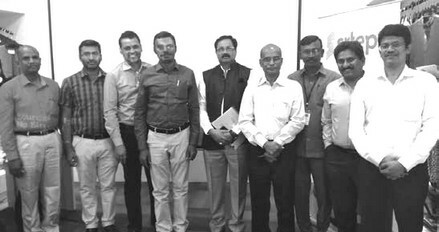 Incidentally, Prof. MM Sharma was the initiator and mentor of the foundation of the UDCT Alumni Association – Ahmedabad Chapter which was inaugutated by him twenty five years ago. Prof. G.D. Yadav, Vice Chancellor, ICT, in his address at the openning session, made a presentation on “Green Chemistry & Engineering in the Safer & Benign Manufacture of Chemicals, Materials & Energy” and highlighted the key role of ICT being played in this area. He also gave details of the ICT’s research activities and ambitious expansion plans including future ones. livelihood of several millions of people is dependent. from man-made fibres and about 25 per cent of the country’s technical textiles. Spinning and Technical Textiles saw tremendous growth during Gujarat Textile Policy 2012.
present in the state, has already been given a separate incentive scheme under the Gujarat Garment &Apparel Policy 2017 (October 2017). lndustry in the State of Gujarat. The scheme called as ‘Scheme for Assistance to Strengthen Specific Sectors in the Textile Value Chain’, will be operative from September 4, 2018 to December 31, 2023. The scheme requires at least 85 per cent of the total manpower of an enterprise and at least 60 per cent of supervisory and managerial staff to be domiciled in Gujarat. The segments covered under the scheme include weaving, knitting, dyeing/printing, machine carpeting, technical textile, made-ups, composite units and other activities in the textile value chain such as embroidery, winding, sizing twisting and crimping. Garments and apparels have been excluded from the incentives scheme under the new policy as these two sectors have been given a separate incentive scheme under the Gujarat Garment and Apparel Policy, 2017 issued in October, 2017. Ginning and spinning have been removed out of the list of over eight manufacturing activities that will be eligible for incentives under various schemes. The scheme provides financial assistance through credit-linked interest subsidy of 6 per cent for MSME and 4-6 per cent for large enterprises with an upper ceiling of Rs. 20 crore per annum. A separate scheme for subsidy in power tariff allows up to Rs. 3 per unit for weaving and Rs. 2 per unit for other eligible segments. The eligibility period for these benefits is five years. The scheme for assistance in compliance of energy, water and environment conservation covers all existing units in operation for more than three years. The scheme provides 20% assistance on the cost of machinery with a ceiling of Rs. 30 lakh and 50 per cent assistance for audit fees with a limit of Rs. 1 lakh. The benefits can be availed once in two years during the operative period of the scheme. For technology upgradation and modernisation in textile value chain, the scheme provides one-time financial assistance of up to 50 per cent of the cost with a limit of Rs. 25 lakh. The State government has also extended support for setting up textile parks with financial assistance of up to 25 per cent of capital expenditure on common facilities and infrastructure with a limit of Rs. 15 crore. The park will also get financial assistance to create hostel facilities within park with minimum 100 workers domiciled in Gujarat. The developer of Park will get complete reimbursement of stamp duty paid on purchase of land required for the new Park. The Vice President of India, Shri M. Venkaiah Naidu has called upon the textile industry to develop a culture of innovation, diversify products and tap newer markets for increasing India’s exports share in the global market. He was addressing the outreach event on ‘Accomplishments and Way Forward for Textile Sector’ and presented Threads of Excellence Awards, here today. The Union Minister for Textiles, Smt. Smriti Irani, the Minister of State for Textiles, Shri Ajay Tamta and other dignitaries were present on the occasion. The Vice President, Shri M. Venkaiah Naidu addressing the outreach event in New Delhi. The Union Minister for Textiles, Smt. Smriti Irani and the Minister of State for Textiles, Shri Ajay Tamta are also seen. 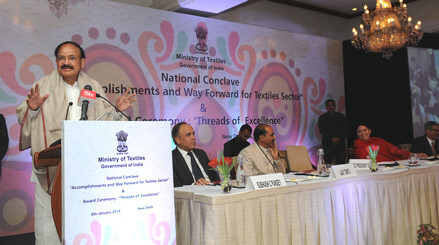 The Vice President, Shri M. Venkaiah Naidu addressing the outreach event on “Accomplishments and Way Forward for Textile Sector” and present Threads of Excellence Awards, in New Delhi on January 06, 2019. The Vice President said that he understands that India’s export performance has been not up to expectations for a variety of reasons. He further said that it cannot be business as usual and the industry has to rise to the occasion and ensure that the share of India’s exports reach double digits from approximately 5 per cent at present. You need to diversify your products and tap newer markets, he added. Pointing out that India enjoys a unique advantage of having abundant raw materials and presence of manufacturing in all segments of the textile value chain, Shri Naidu said the sector needs to improve supply chains, focus on research, cost optimization and scaling-up to achieve greater competitiveness and a higher share in the production and export of top items traded in global markets. 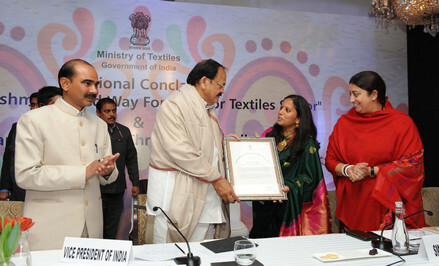 The Vice President, Shri M. Venkaiah Naidu presenting the Threads of Excellence Awards, at the outreach event on ‘Accomplishments and Way Forward for Textile Sector’, in New Delhi on January 06, 2019. The Union Minister for Textiles, Smt. Smriti Irani and the Minister of State for Textiles, Shri Ajay Tamta are also seen. The Vice President, Shri M. Venkaiah Naidu presenting the Threads of Excellence Awards, at the outreach event. The Union Minister for Textiles and the Minister of State for Textiles are also seen. 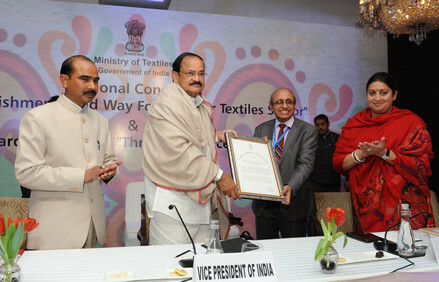 Observing that this was the ideal time for the industry to discard outdated technology and modernize its machinery to be globally competitive, Shri Naidu said the availability of raw materials, low cost and skilled manpower was an added advantage for the Indian textile industry, which is expected to reach US$ 223 billion by 2021 from. The Vice President said that quality has to be the mainstay for India to sustain exports in the global market in the face of stiff competition from Bangladesh and Vietnam. 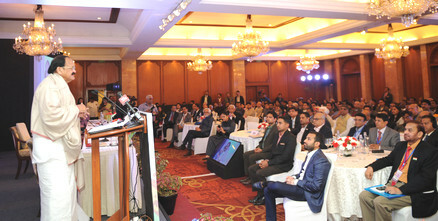 Referring to various measures taken by the government like allowing 100 per cent FDI and Technology Upgradation Fund Scheme to accelerate textile industry’s growth, the Vice President advised the industry to focus on innovation and value addition for improving global competitiveness of the Indian textiles and apparels. “Innovation is the key. We have to come up with innovative and exclusive products if we have to expand our footprint in the global arena”, he added. He also stressed the need for promoting waterless dyeing by adopting new technology. The Vice President presented the Threads of Excellence Awards to various organizations and individuals who have shown their excellence in the textile industry. 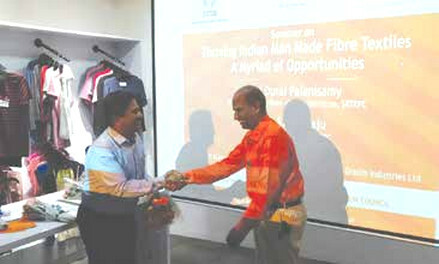 The Synthetic & Rayon Textiles Export Promotion Council (SRTEPC), Mumbai, the apex Export Promotion Council of MMFT exporters organized a seminar on Thriving Indian Man Made Fibre Textiles – A Myriad of Opportunities on 18th December 2018 at ‘Liva Studio’,Tiruppur in association with SIMA and Grasim Industries Ltd. 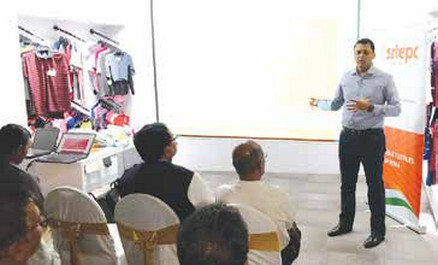 The Seminar was intended to create awareness amongst the textile community in and around Tiruppur region about the prospects for further growth of Man-made fibre textiles and bring more textile manufacturers and traders as members of SRTEPC. Mr. Murali Balkrishna, Joint Director opened the session by welcoming the gathering of about 50 guests and invited the distinguished Chief guest Mr. Durai Palanisamy, Director, Pallavaa Group & Member-Committee of Administration, SRTEPC, Mr. S. Balaraju, Executive Director, SRTEPC, Mr. D. Jayaraman, Asst. Director (Head-Spinning), SITRA, Mr. M. Natarajan, Asst. VP (Sales & Marketing), Zonal Head (Southern Region) Grasim Industries Ltd, Mr. M. Balasubramanian, Dy. Director & Officer In-Charge, Regional OTxC, Coimbatore and Mr. M. Duraisamy, Past Chairman, PDEXCIL and MD, Surya Cotton Mills Ltd. He thanked Mr. M. Natarajan for supporting the Council in its endeavor to promote manufacture and exports of MMFT in the textile cluster of Tirupur. He spoke of the need for partnership and collaboration of likeminded associations and companies to further the cause of MMFT in these clusters. Mr. M. Natarajan presented the distinguished guests with bouquets. Shri Durai Palanisamy, Director, Pallavaa Group & Member-Committee of Administration, SRTEPC delivering the special address. Mr. Durai Palanisami in his Keynote Address spoke about the huge opportunity for manufacturers in the South to get into exports of MMFT. While he agreed that the domestic market is huge, he pointed out that situations like the demonetization and GST implementation which resulted in lower business in the domestic market could be offset by being present in exports and hence it is imperative to have a backup plan in place. He spoke of the high per capita consumption of textiles globally and the low consumption in India which presented a great opportunity for Indian Manufacturers and exporters. The limitations of natural fibre meant that the gap had to be filled by MMFT and its blends. He urged the audience to the benefit of the expertise of organizations such as SRTEPC and Grasim Industries. Mr. S. Balaraju, Executive Director, SRTEPC presented the Council and its services to the audience. He delved at length on the role played by the Council to protect the domestic industry and the policy changes facilitated by the Council through its continuous and effective representations. He spoke of the refunds in GST, Duty Drawback, ROSL etc facilitated by SRTEPC to its member exporters. The Executive Director with his in-depth knowledge on MMFT briefly touched upon the current market scenario of MMFT in the world. He informed the gathering that India is the largest supplier of MMFT products in the world after China and supplies it to over 150 countries. 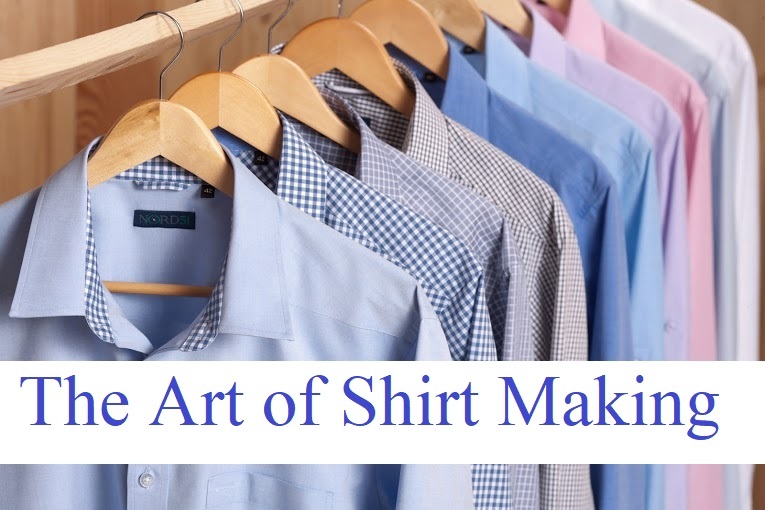 “There is a tremendous growth in the global textile market with huge demand for MMFT products and we should take advantage of the rising demand in the overseas market” said the Executive Director. He praised SIMA, Grasim Industries Ltd. and other Clusters in the region for playing an important role in developing the MMFT sector in Southern India. “The Ministry of Textiles, Government of India has always supported and encouraged by providing necessary incentives and other benefits to help our industry to grow” conveyed by the ED. He also said that the onus now lies on the individual companies to take advantage of the myriad of opportunities and urged the guests in attendance to be part of the SRTEPC family by becoming member and take benefit of various services and initiatives undertaken by the Council to assist exporters in their development and growth. He also informed them about the activities planned for the next financial year. Prof. (Dr.) R. V. Adivarekar, Head, Dept. 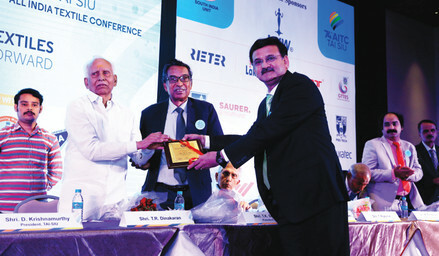 of Fibres & Textile Processing Technology, U. I. C. T. has been awarded Hon. F.T.A. for his significant contribution in the academic field, Shri G. V. Aras, Director, A.T.E. Enterprises Pvt. 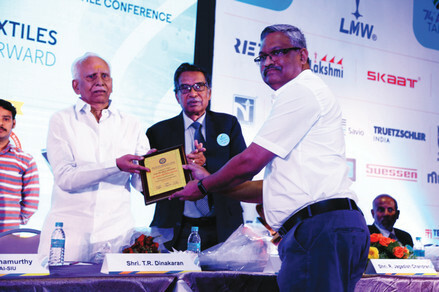 Ltd. was conferred Service Gold Medal in recognition of his contribution and services to the textile industry and Shri R. R. Patil, CEO & Managing Director, Gokak Textiles Limited was awarded a Service Memento for his dedicated services in the activities of TAI, Mumbai Unit. The Felicitation was held during 74th All India Textile Conference held on 15th & 16th December 2018 at Coimbatore. Prof. (Dr.) R. V. Adivarekar receiving Hon. FTA by the hands of Chief Guest Dr. T. R. Dinakaran, Chairman, Shri Ramalinga Group of Mills, T.N. Shri R. R. Patil receiving Service Memento by the hands of Chief Guest Dr. T. R. Dinakaran, Chairman, Shri Ramalinga Group of Mills, T.N. Shri G. V. Aras receiving the Service Gold Medal by hands of Chief Guest Dr. T. R. Dinakaran, Chairman, Shri Ramalinga Group of Mills, T.N. The South India unit of the Textile Association (India) (TAI SIU) conducted the 74th edition of All India Textile Conference at Hotel Radisson Blu here on December 15 and 16. The TAI organises the event every year at one of its 27 federal units. The South India unit of TAI conducted the event this year, after a gap of 25 years. The event was organised in association with SIMA, Indian Texpreneurs Federation, Tamilnadu Spinning Mills Association and Tirupur Exporters’ Association. The focus of the conference was on competence of the spinning sector of the textile industry. 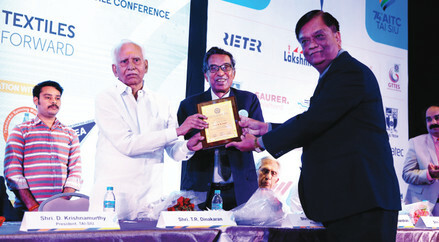 On this occasion, the organisers also honoured R Jagadish Chandran, Chairman, Premier Mills (P) Ltd with the Life Time Achievement Award and Sanjay Jayavardhanavelu, Chairman and Managing Director of Lakshmi Machine Works with the Industrial Excellence Award for their contribution and service to the textile industry. March 19, 2018, Kochi India – The Lenzing Group (Lenzing) has introduced TENCEL™ Intimate to the India market at Intimasia 2018, the country’s largest fashion trade show dedicated to lingerie and intimate wear with the participation of over 70 local and international intimate apparel brands. Held at the Adlux International Convention and Exhibition Centre in Ernakulam, Kochi, Intimasia is committed to elevating the intimate wear business by promoting fashion, innovation and ideation. Bringing the intimate apparel industry together, the event aims to contemplate the way forward for the fastest growing sector of the textiles and apparel industry in India. Rajnagar Textile Mills (A Unit of National Textile Corporation Ltd., Ahmedabad invites tenders for Non-ionic Sizing Softner. 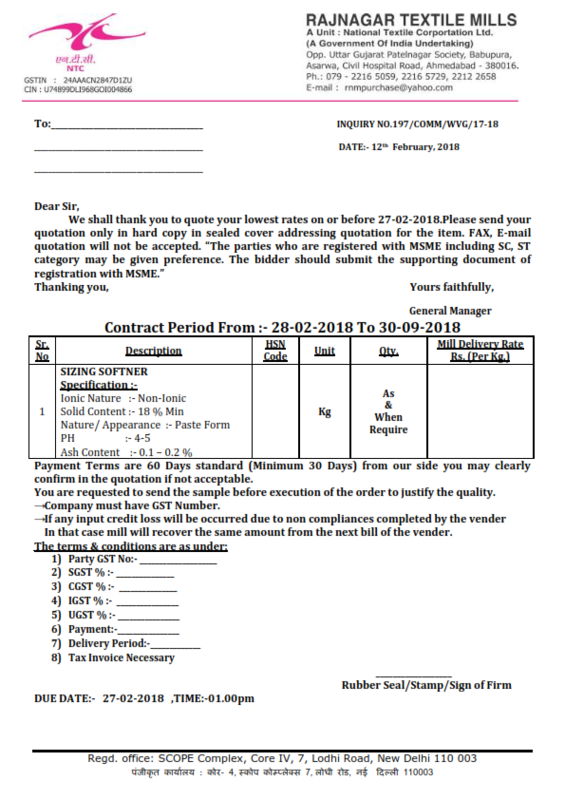 Contract Period: 28-02-2018 to 30-09-2018. Last date: 27-02-2018. The form is given below. It can also be downloaded from here. According to statistics of the General Administration of Customs, in December 2017, China’s textile and garment exports amounted to about US$ 24.01 billion, seeing year-on-year rises of 2.49% and a rise of 3.90% from the previous month. Thereunto, the exports of yarn, fabrics and related products totalled US$10.16 billion, with year-on-year growth of 10.98% and a growth of 1.72% from the previous month; the exports of garment and accessories was US$ 13.85 billion, down 2.96% year-on-year, seeing an increase of 5.55% from the previous month. In 2017, China’s textile and garment exports totalled US$ 266.95 billion, growing by 1.53% year-on-year. Thereunto, the fabrics exports was US$109.77 billion, up 4.5% year-on-year; and the garment exports was US$ 157.17 billion, declined by 0.4% year-on-year.